Today CBLDF joins with other members of the National Coalition Against Censorship to protest the removal of emily m. danforth’s The Miseducation of Cameron Post from library shelves at Sussex Central High School in Georgetown, Delaware. The ongoing challenge to the book was brought to light in the midst of a separate dispute over the health curriculum in the same district. Cameron Post previously made news this summer in the Cape Henlopen school district, also in Delaware. In that case the school board initially removed the book from a high school summer reading list without following a district challenge policy, ostensibly because it contained profanity. When nationwide advocates pointed out that some other books on the list had their share of profanity, the board agreed and scrapped the entire list. Many critics suspected that board members’ underlying objection to Cameron Post was not the profanity but the lesbian protagonist. Sussex Central High School, the location of the new challenge, is in the Indian River School District which neighbors Cape Henlopen. CBLDF has already joined another coalition effort protesting one Indian River school board member’s effort to censor a new health curriculum. Board member Shaun Fink objects to the curriculum’s description of homosexuality as “normal.” In the midst of debate over that issue at a board meeting last month, a Sussex Central student pointed out that Cameron Post had been removed from his school’s library. As it turns out, the book had been challenged by school board president Charles Bireley and was under review by a committee. Since that time the committee has voted unanimously to reinstate the book in the library, but Bireley has appealed that decision to the school board which will likely vote on the issue at its meeting on Monday. (One certainly hopes he will be recused from that vote!) As in Cape Henlopen, Bireley’s challenge is ostensibly due to profanity in the book. Without questioning the sincerity of the community member who objects to the books, his views are not shared by all, and he has no right to impose those views on others or to demand that the public [school] library holdings reflect his personal preferences. 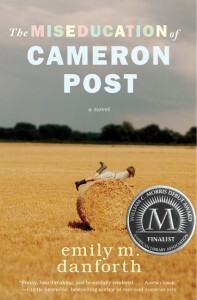 We urge you to endorse the recommendations of both the committee and the Superintendent by returning The Miseducation of Cameron Post to the library shelves of Sussex Central High School, so that those students who wish to read it may do so. This result would show respect not only for intellectual freedom, but also for all members of the school community by allowing individuals to make reading choices based on their own views and values. Read the full letter below, and watch this space for news of the board’s decision next week!